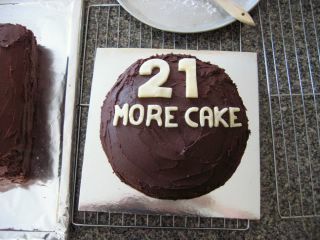 So, my 21st birthday cake. It was a chocolate cake. In fact, the ultimate chocolate cake. It was Nigella Lawson’s Chocolate Fudge Cake, from Nigella Bites. I made it in triple quantities, baked it on Wednesday in two 24cm square tins at 160o for 1 hour and 40 minutes each. I then iced them on Thursday night, also in triple quantities. Check out the ingredients of the icing! That’s a whole lotta icing! 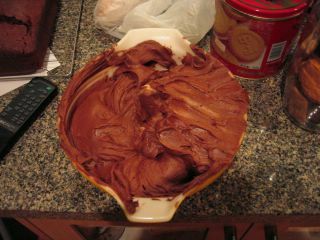 It was so much fun doing the icing. There was chocolate everywhere! Smeared on the kitchen benches, the stove, the microwave, and my t-shirt. Fun fun fun. However, I panicked on Friday morning that there wouldn’t be enough cake (63 guests, you see), so I quickly whipped up another one. This time I tried the Old Fashioned Chocolate Cake from Nigella’s Feast. It’s an evolved version of her Sour Cream Chocolate cake from How to be a Domestic Goddess. I’ve made the Sour Cream Chocolate Cake before, and wasn’t impressed, but EVERYONE on the Nigella.com forum raves about the OFCC, so I thought this would be a good excuse to try it. Then I decorated both cakes, using rolled out marzipan. 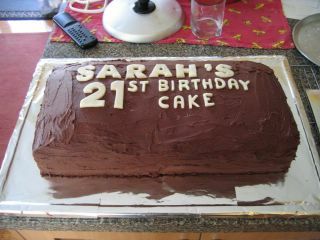 For “SARAH’S”, I printed out the letters with Arial black size 150 font, and then cut them out. 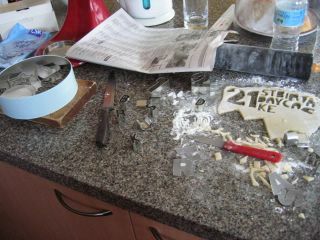 For the rest, I used my Nigella Lawson Living Kitchen Cookie Cutters! My mum LOVED the words I put on this one. So at the party, we almost finished the large cake, and didn’t even get started on the second one. Oh well, best to be never knowingly undercatered, as Nigella herself might say. The reaction to the cake was very positive. Partly due, I think, to the fact that I mentioned it in my speech. Sarah: And I’d also like to thank me, for making my cake. It’s really delicious, it’s a Nigella Lawson Chocolate Fudge Cake, so you’d all better eat it. In the wee hours of the morning, after Robbie and I returned home, we wolfed down a bit more of each cake. And just for the record, the Old Fashioned Chocolate Cake is very nice. But the Chocolate Fudge Cake is superior, in all respects. The Old Fashioned Chocolate Cake is more cakey, and less densely chocolate. Also, the icing is grainier, whilst the Fudge Cake’s icing has a wonderful teeth-coating, throat clogging smoothness. I think one might be satisfied with the Old Fashioned Chocolate Cake, but only if they’d never tasted the Chocolate Fudge Cake before.